← Don’t ignore the middle of the country! I do the same thing using this free website. Any holes and stuff can be drawn on after download. I wish either of them actually made holes, etc for trapped nuts in order to secure these together with 3mm screws. I’ve had trouble with the plugin python version vs the native python version Inkscape is using. Has that been resolved? I own an Epilog Laser Cutter and Inkscape is a terrible software to use with it. Which is really sad as it is an otherwise fairly good (and open source!) software package. It’s just that any kind of vector cutting with it is nearly impossible because of the way it treats the lines. There MIGHT be a fix but if there is, I don’t know of it. Have you tried saving the image as another format? By default, Inkscape saves in its own special SVG format, but it can also save as a standard SVG (and as many other formats). Perhaps one of those will work better for you. I regularly use an epilog laser cutter at my local FabLab and have never had any problem with inkscape, the trick is to set cut lines to 0.01mm and save the file to a pdf, open the pdf in the reader of your choice and print to the laser cutter. Hope this helps. Wow, that’s kinda freaky, I was thinking of your box builder extension yesterday and here it is. Thinking to use it to build a RasPi case, since I want something with really tight tolerances. Actually, did you teach it to do mid height slots like the ones I did manually for that led matrix box? I need to get work to stop exploding for long enough to let me get back to the lab and finish the cuts for the top of it. Grats on getting this on HAD, much deserved. As Elliot says, the trick of getting good repeatable vector cuts on the Epilog seems to lie in using PDF as the printing format. Set line to 0.01mm before exporting, ensure transparency on the lines is off, use outline rather than fill. Should be all you need. Get it not quite right and the Epilog returns a job finish instantly, since in vector mode it filters out any invalid elements before sending the job to the cutter. It even works if you use Inkscape to stage a raster within a vector cut, export it to pdf and then use mixed mode with colour mapping to do multi depth engraves and cuts in the same job. 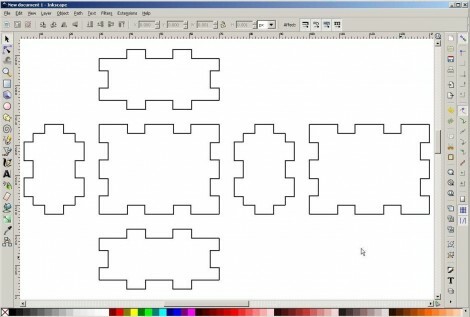 Heh, I used to do the same in openscad and then export to dxf..